The Italian steel distributor segment has a large number of relatively small companies, which are still affected by weak demand and pressure on margins. 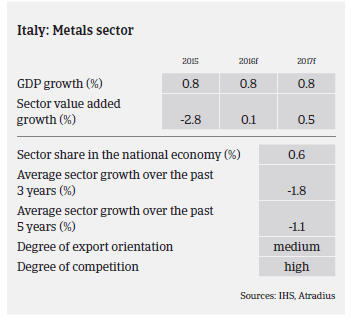 For the Italian economy the metals, and in particular, the steel industry are of major importance, accounting for about 2% of GDP. The steel sector suffered from massive production and consumption decreases in 2009 and again in 2011-2013, due to weak demand, overcapacity and flat prices, with all the players along the value chain suffering from deteriorating margins. Since then the industry’s performance has bottomed out, thanks to increased demand from the automotive sector. Demand from construction, however, which accounts for about 50% of steel consumption, remains flat. All businesses along the value chain, from steel mills to service centres and wholesalers, are impacted by the still subdued domestic demand for steel. Italian steel production decreased by more than 7% in 2015, to 22 billion tonnes, and continued to decline in Q1 of 2016. In addition to the subdued demand, producers suffered from low cost Chinese steel imports, especially in the flat steel products segment (prices of flat products imported from China are on average 15% cheaper than domestic products). The Chinese competition has also taken advantage of the fact that the Ilva steel mill still operates well below full capacity. The outlook for the Italian steel and metals industry in H2 of 2016 and early 2017 remains mixed, as exports benefit from a weaker euro exchange rate. However, the Algerian market as one of the main export destinations (together with Germany) is expected to mature within the next 4-5 years and has recently imposed limits on steel imports. 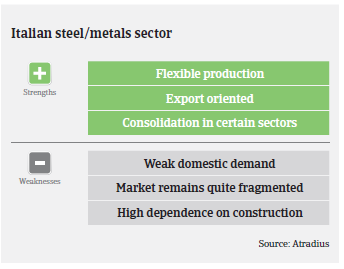 While steel and metals prices are expected to rebound somewhat in the coming months, helping to stabilise businesses´ margins, excess production capacity will remain an issue for the industry. Despite the on-going challenges, payment delays are not expected to increase for the time being after increasing in 2015. However, businesses operating in the domestic market are still affected by slow payments from their customers. Insolvencies are not expected to show a major increase in 2016, however, caution is advised due to the still fragile nature of the sector. 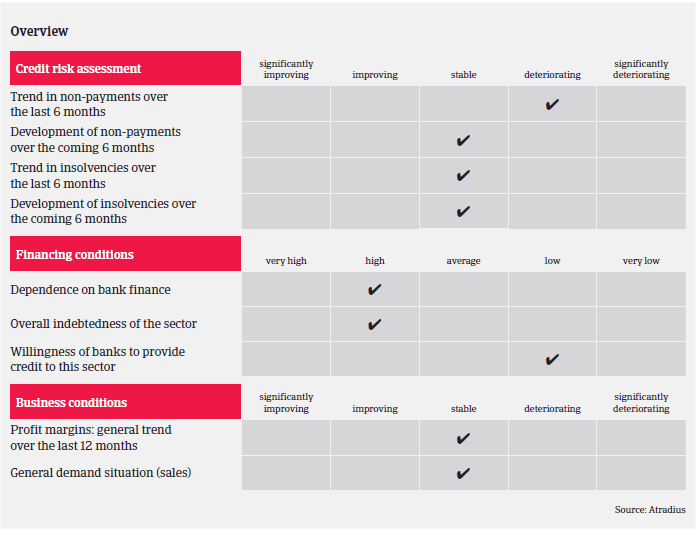 Our underwriting stance remains generally neutral to cautious, depending on the performance of the subsectors and their main buyer industries. The Italian chemicals industry benefits from a rebound in domestic demand, however businesses dependent on the construction sector still face higher risks.